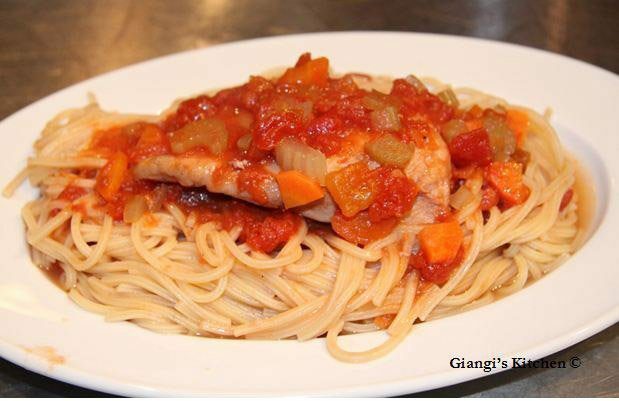 Chicken cacciatora is an all time favorite of my mom and she shared her recipe with me. The sweetness of the carrots blended with the tomatoes and bell peppers, as a result you have a sauce with wonderful aroma and taste. Another way to prepare this wonderful dish is on your pressure cooker. In less than 20 minutes. Add all the ingredients together, seal and cook according to manufacturing direction. The chicken can be paired with mashed potatoes, pasta or rice. Spaghetti rigati will absorb the sauce best. Our choice tonight was “Spaghetti Rigati”. Great left over dish…if there are any left. Add the olive oil in a medium pan over medium heat. Add the chicken skin down and brown, 2 minutes and turn. Add the celery, carrots, garlic, the tomatoes and the wine.